Java is necessary only for certain features of LibreOffice, Apache OpenOffice and perhaps to allow other software to run on your computer. Java no longer runs on recent browsers because they no longer offer a version which supports NPAPI, the technology required to run Java applets. Running outdated browsers (or Internet Explorer) with this capability puts your computer and your privacy at risk. The Java license changed on April 16, 2019 with the release of version 8 update 211. These free downloads are only available for personal use. Commercial use is subject to a fee. Java, along with Flash and Adobe Reader, has been known to make Windows insecure for some time. Mac and Linux users now share that vulnerability. Remove Java if you don't need it. If installed, be sure to frequently update it and to uninstall older versions. Oracle has deprecated all support for browser plugins starting with version 9 (released in September 2017 and no longer supported). If installed, I recommend disabling the Java plugin in your web browser — enabling it ONLY for trusted sites. See Java browser plugin recommendations. Update Java whenever updates are available. These releases fix security flaws in Java. What actions can I take to increase the security of Java? Version 9 removed all support for browser plugins, primarily because the major browsers no longer support them, largely a result of the rapidly growing mobile market that never supported Java. Java versions 9 and 10 were short-term (half-year) releases. Java version 11 was released on September 25, 2018. Java version 12 was released on March 19, 2019. Java version 13 is expected to be released September 17, 2019. Prevent Java Updater from installing third-party software. Open the Java Control Panel: Start ⇒ Control Panel ⇒ Java. If you see categories in the Control Panel, look for Java in Programs. If you uninstall Java, this setting will be removed, but as long as you de-select any optional software when downloading new Java versions and check during installation you shouldn't see third-party software installed on your system. I recommend uninstalling all previous versions of Java when updating. Old and unsupported versions of Java are a serious security risk and can leave your system vulnerable. Java's updater may not automatically remove all older versions, leaving your system vulnerable. 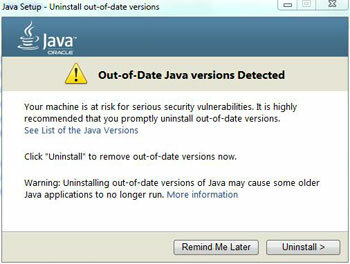 Oracle provides instructions for uninstalling out-of-date Java versions. I recommend that you manually verify that older versions have been removed from your system. You can also run the Java Uninstall tool. See also, How do I uninstall Java on my Windows computer? To secure your computer I recommend that you manually uninstall all current versions, cleaning out any remaining Java-related AppData entries before installing the most recent version available so you're running only the most recent version. Alternatively, you need to check to see if option to uninstall older versions has removed all older versions. In either case, I recommend cleaning up the Java folders in AppData. You need to be careful when following the instructions in this section. You can seriously harm your Windows installation if critical files are removed. This image if for illustrative purposes only. When this image was captured Java 8 Update 51 was the current version but is now obsolete. Be sure you've either uninstalled Java (all versions) or have run the option to uninstall outdated versions before proceeding. Like most Windows programs, Java keeps data in AppData (in folders labelled Oracle and Sun in the LocalLow folder). Navigate to the Java folders by opening the AppData then LocalLow folders. If you've uninstalled Java completely, you can delete both the Oracle and Sun folders. If you've only removed outdated versions, open the Sun folder then delete any folders containing older versions that is present (the jre1.8._45 folder in the above example). The AppData folder is located in C:\Users\[user]\AppData. Navigate to the C: drive then open the Users folder and look for a folder with your user name. Inside you'll see the AppData folder (if you've made hidden files and folders visible). The AppData folder is normally hidden by Windows. Windows 7 users can change this in the Folder Options in Control Panel to show hidden files, folders and drives in the View menu. Windows 10 users can change this in File Explorer Options (search for “File Folder Settings”). Check “Show hidden files, folders and drives” in the View menu. In current versions of Firefox, NPAPI-based plugins other than Flash are blocked. This includes the removal of support for Java. Most current browsers no longer support Java plugins and Oracle has responded by deprecated all support for browser plugins starting with version 9 (released in September 2017 but already obsolete). Java 8 continues to be available, but will now be the last remaining version of Java available to consumers that will support browser plugins. The functions these plugins provided is now primarily provided within the browser itself using HTML5 technologies but sites requiring Java or similar discontinued technologies will no longer work. Mozilla support provides instructions on how to allow Java on trusted sites (e.g. for Pogo.com). This workaround will not allow you to run Java in Firefox version 52 or later. Opera is recommended if you need to run Java on sites like Pogo. Opera links to Java 9 which is no longer supported (download version 8 from Oracle instead). Internet Explorer 11 is the only other browser that may continue to support Java, but should not be used for regular surfing because it is both vulnerable and deeply tied into Windows. Pogo now has three classes of games based upon their requirement for Java, Flash or HTML5. In the near future only the HTML5 versions will continue to work because of changing technology. I found Pogo's documentation for running Java was not current and didn't help with Firefox. Because security vulnerabilities are discovered all the time, it is recommended that you regularly update to the latest Java version and ensure older ones are removed. Get the latest Java version. The Java downloads for all operating systems page has offline installers for various installations. You can test your Java installation on the Java verification page if your browser supports Java plugins. The more recent versions of Java (currently Java 10) are available from Oracle and include JDK, Server JRE and JRE. Consumers should choose the JRE. Note that these versions will no longer support browser integration. Windows system requirements are relatively minor: a Pentium 2 266 MHz or faster processor with at least 128 MB of physical RAM is recommended. You will also need a minimum of 124 MB of free disk space. Windows 10 (8u51 and above), Windows 8.x Desktop, Windows 7, Windows Server 2008 R2 SP1 (64-bit) and Windows Server 2012 and 2012 R2 (64-bit) are supported. Windows XP can run Java but it is not officially supported (nor recommended). Java support in browsers is fast disappearing even as the use of 64-bit browsers is gaining strength. Most browsers already block Java even if it is installed. Current Java versions (except version 8) will no longer support Java plugins within browsers. However, Java is also used by programs like LibreOffice and OpenOffice for certain functions. It is recommended that you install 64-bit Java on 64-bit systems; 32-bit otherwise. If you have both versions installed, you'll have to update both for security reasons. It is safer to uninstall Java if you no longer require it. How to install Java for Linux. See Java downloads for all operating systems for offline installers for Linux. Installing Java on the Mac has changed with the release of the newer versions (Oracle's Java version 7u25 and below have been disabled by Apple in OS X). Java 8 requires an Intel-based Mac running Mac OS X 10.7.3 (Lion) or later and administrator privileges for installation. See Oracle's Java downloads for all operating systems for offline installers for the Mac and the Mac download FAQ. Legacy Java 6 is available from Apple, but is not supported. Java is most visible in online games such as those on Pogo.com and Yahoo Games as well as many phone- and tablet-based applications. Enterprise-level Java applications run services for companies. Oracle purchased Sun and along with it the rights to Java. Oracle is an established company long associated with corporate software. Java is a cross-platform environment used to create regular programs that can run on virtually any operating system and on thousands of other devices. The only requirement is that a Java “virtual machine” (JVM or JRE) is available for the operating system or device which translates Java into something the operating system or device can understand. You might want to check out Oracle's Java SE Security so you understand the risks of installing and running Java. The most common use of Java is still small programs called applets, but there are Java programs, especially in the emerging phone and tablet markets. The Rise and Fall of the Java Applet: Creative Coding's Awkward Little Square. BlueJ is freeware used to teach object orientation with Java. Oracle Technology Network's Java site. DZone — the heart of the Java developer community. Java 101: Learn Java from the ground up. The history of Java technology. ITtoolbox Java is a content, community, and service for Java professionals. The comp.lang.java FAQ List contains some interesting historical information.